This module covers the fundamentals of manufacturing biomass pellets on the farm, to be used as a renewable fuel. 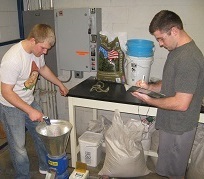 Procedures, equipment, and economics are all discussed, with ample time for questions and feedback. Module Author, Dr. Dan Ciolkosz, is a research and extension associate in Penn State’s Department of Agricultural and Biological Engineering. He works to develop engineering know-how that will help Pennsylvania’s farms produce bioenergy and improve energy efficiency. His research currently focuses on the biomass densification and thermochemical conversion, in an effort to improve the efficiency and effectiveness of the process.